Howard Carter Lease | Vehicle Account Manager – Apply Now! 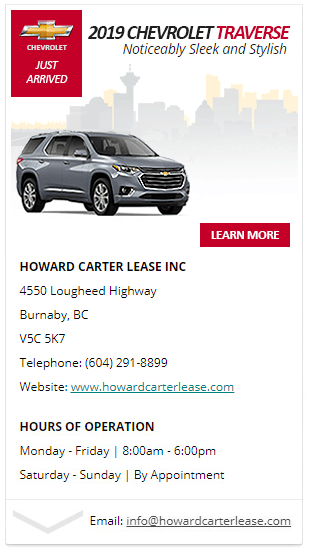 Howard Carter Lease Ltd., (wholesale lease division for the Carter Auto Family) is now accepting applications for an Account Manager to join our SUCCESSFUL TEAM at our Burnaby location. For over 50 years – The Carter Auto Family has striven to make our customer’s vehicle purchase and maintenance experience a truly positive and easy process! Self starter with close attention to detail with a proven track record to match! We are an Equal Opportunities Employer. Qualified candidates are invited to apply in confidence today.